According to the Administrative Law of the People's Republic of China on Entry and Exit of Foreigners, foreigners entering China should apply for a visa to the Chinese diplomatic representative or consular offices, or other institutions authorized by the Ministry of Foreign Affairs of People's Republic of China. While applying for a visa, a visa notice issued by an authorized Chinese organization should be presented. Visa notice could be obtained from the Chinese host organization, or the Chinese side of a joint venture, or the warranty company of the foreign representative office and the solely oreign-invested company, after being reviewed by the corresponding supervising commission, office or bureau and approved by the authorized organization. Invitations belonging to foreign trade sector should be submitted to the Municipal Foreign Trade and Economic Cooperation Commission for examination and approval and issuance of visa notice; invitations belonging to tourist sector should be submitted to the Municipal Tourism Administration Commission for examination and approval and issuance of visa notice; the entities registered in Pudong New Area inviting foreigners to come to China for business activities should submit the application to the Pudong New Area government for examination and approval and issuance of visa notice; the authorized group companies issue visa notices to foreigners invited by their affiliates for trade or investment activities; other visa matters shall be dealt with by the Foreign Affairs Office of the Shanghai Municipal People's Government (SHFAO)for the issuance of visa notice. For the convenience of foreigners traveling to China, Shanghai authority offered 48-hour transit visa-free service to foreigners from Japan, Korea, Singapore, USA and some European countries who are connecting flights at Hongqiao and Pudong Airport starting on Jan. 1, 2000. The Chinese visas are divided into four types, i.e., diplomat, etiquette, business and common. "F" visa is issued to foreigners invited to China for purposes of visits, research, lectures, business, scientific, technological and cultural exchange, short-term study as well as attending international meetings and other events. The host organization should provide the following material when applying for a visa notice: written application, well-completed visa notice form; for those attending international conferences and other large events in Shanghai, a letter of approval shall be enclosed from the supervising agency about the organization of those events for which purpose the foreigners are invited. "X" visa is issued to foreigners coming to China for training or field study. The applicant shall submit the well-furnished JW202 Form to SHFAO for approval after having been reviewed and approved by the Shanghai Education Commission. A name list shall be enclosed if there are over 5 members in the delegation. "L" visa is issued to tourists or persons coming to China for personal purposes. "Z" visa is issued to foreigners who are going to be employed in China and their family members. The maximum period of stay is one year. "C" visa is issued to the international train staff, plane crew and seamen who are carrying out their respective duties in China as well as to their family members. "J1" visa is issued to the resident foreign journalists in China and their family members. "J2" visa is issued to the foreign journalists conducting interviews in China on a short term basis. The validity period of a visa refers to the time limit for the bearer to enter China, and it is irrelevant to the duration period of stay in China. The duration of stay refers to the period allowed for the bearer to stay in China starting on the date of entry. 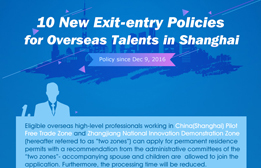 If the visitor fails to complete his/her work at the duration period of stay, he/she should go to the Entry and Exit Administration of the Shanghai Public Security Bureau to extend the visa. 30 days of extension could be granted to a "F" visa if the application is submitted by the bearer?ˉs host organization while 90 days could be granted if the application is submitted by the supervising commission, office or bureau of the host organization and the visa could be renewed repeatedly within one year. "L" visa can be renewed only once for 30 days.